The perfect meal out, in. Jalfrezi, literally meaning ‘hot fry’, is a Bengali dish that originates from the time of the British Raj when cold cuts were fried up with spices, tangy peppers and chillis. There are many recipes that are passed down through the generations. For ours, native North Indian chefs have added their own twist on a classic: naan dumplings infused with Kalonji black onion seeds. Freezing is nature’s preservative. It’s the most natural way of keeping our jalfrezi at its best because there’s no need for artificial colours, flavours or additives. The dumplings are partially submerged in the curry, allowing the spices and flavours to penetrate the dough. The freezing process also helps the dumplings stay just right – not too soft, not too firm – and locks in the clean fresh fried flavours of the jalfrezi peppers. Without doubt one of the most popular and best-loved Indian dishes is the chicken jalfrezi. Ours is inspired by the teachings of native North Indian chefs, and hand prepared ahead of time, ready for you to cook. It’s like your very own takeaway service, without worrying when the delivery driver will show up. For best results, cook in the oven. Pierce film lid several times. Place on a baking tray in the centre of a pre-heated oven 200°C / FAN 180°C / Gas Mark 6 for 60 minutes. Remove film lid and cook for another 15 minutes. For best results, cook in the oven. Pierce film lid several times. Place on a baking tray in the centre of a pre-heated oven 200°C / FAN 180°C / Gas Mark 6 for 40 minutes. Remove film lid and cook for another 5 minutes. HAVE YOU TRIED IT WITH...? Finely chop 1 bunch of fresh mint (or 2 tsp. mint sauce), 1 bunch of fresh coriander and ½ cucumber into 1 cm chunks and add to 1 pot of natural or Greek yoghurt. Add 2 tbsp. white wine vinegar or lemon juice, salt and pepper to taste, and stir well. Chill in the fridge for 1 hour before serving for the ultimate palate cooler. Place 2 tbsp. sliced almonds in a dry frying pan over a low heat and gently toast until golden brown. In a bowl, mix 1 bag of spinach with 1 tbsp. olive oil, lemon juice, 1 finely chopped red chilli, salt and pepper. Transfer to a steamer and cook for 2-3 mins until spinach is wilted. Sprinkle the almonds over the top for that added crunch. It’s hard to get beer and curry wrong. But with a little research, you can make this match even more heavenly. For a jalfrezi, we recommend a sweet, hoppy, strong-flavoured pilsner, which will cut through the tangy, tomato-rich sauce without overpowering it. 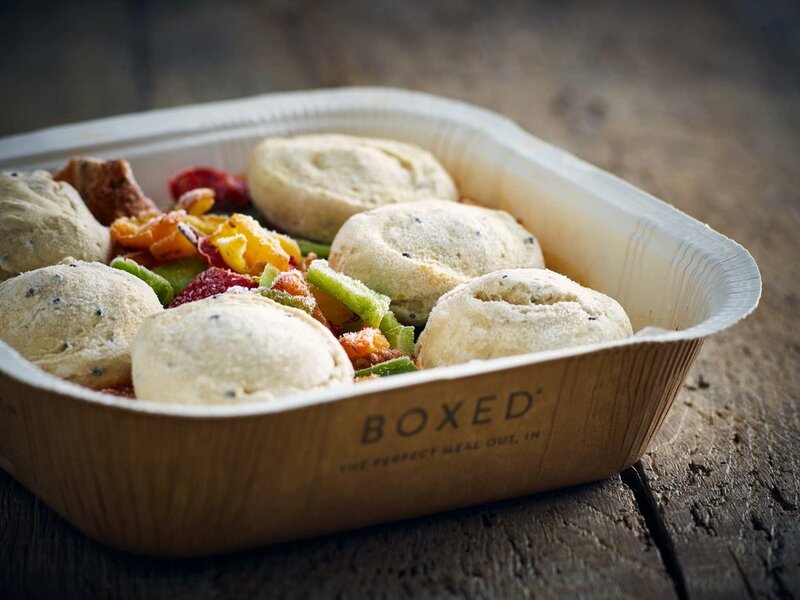 WANT TO LEARN MORE ABOUT BOXED?